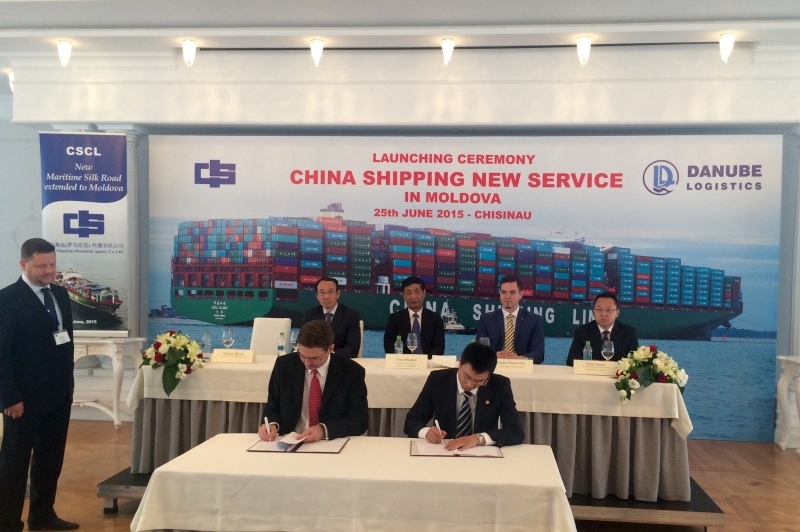 On 25 June 2015 China Shipping Container Lines and Danube Logistics, the general investor and operator of Giurgiulesti International Free Port, signed a terminal service agreement enabling China Shipping Container Lines to expand its global container shipping services to Moldova. The decision of Chine Shipping Container Lines to expand its services to Moldova is part of the Chinese government’s initiative to revive the ancient Silk Road via its Silk Road Economic Belt and 21st Century Maritime Silk Road projects. China Shipping Container Lines is third international container shipping lines offering a direct service to Giurgiulesti International Free Port. In 2014 the transshipment of containers via Giurgiulesti International Free Port increased by 68% to more than 11,000 TEU. Last year 57% of import containers originated from China and 76% of the export containers were shipped from Giurgiulesti International Free Port to Asian markets. Thomas Moser, the Chairman of Danube Logistics stated: “China Shipping Container Lines decision to offer direct services to Moldova via Giurgiulesti International Free Port is the result of our successful collaboration over the last three years. Moldovan exporters will from now on be able to export their goods in regular or refrigerated containers from Moldova with China Shipping Container Lines’ to the world market. Especially Moldovan companies exporting agricultural goods to the fast growing markets in Asia and the Arabian Gulf will greatly benefit from this new service. Danube Logistics, the general investor and operator of Giurgiulesti International Free Port, is a wholly owned subsidiary of the Dutch company Danube Logistics Holding BV.